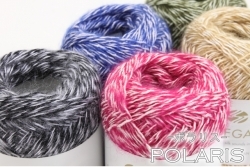 Silk mohair yarn combining the finest mohair and silk noil yarn. Natural luster and lightness, soft touch is characterized. You can enjoy making various works.